This is one event where we can usually guarantee a good turnout of cars, this year we had twelve in line along the back fence of where they usually hold the Swapmeet. The Swapmeet was transferred to a small area where we usually are along the fence at the side of the large building containing the main aircraft display, (which was greatly reduced inside for maintence) near the train station. Most of the Swapmeet seemed to be General items, not many part related. As Motat is in the process of redesigning and building new buildings, most of that area was cordoned off by a large fence. We managed to get the biggest turn out of cars for our club events during the year like always. Paul and Delia brought their beautifully restored Cortina (not their official club car); Harvey, Model Y; Bud and Thelma, 1950 Prefect; Brian, 7W; Dennis, 45 Prefect; Chris, 37 Y; Cynthia, 54 Popular (former member); Peter and Janet, 53 Prefect; Les and Leonie, 37 Ford 10; John and his family, Anglia and Tourer; Steven, 49 Prefect. Other members were also there but without cars, I saw Mr. and Mrs. Cleland, Martin, and Terry and daughter Brenda, who were with the Bradford section. The Bradfords had at least 26 cars and a great display. They were the overall winners again this year. 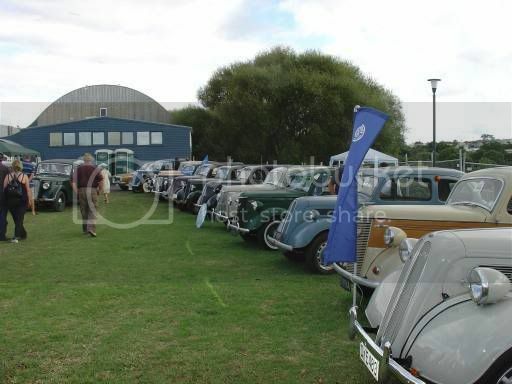 This is usually a good day out for members as they bring along a picnic, its not too far to go and all the cars of various clubs are there to look at, so perhaps you will be able to make it next year.